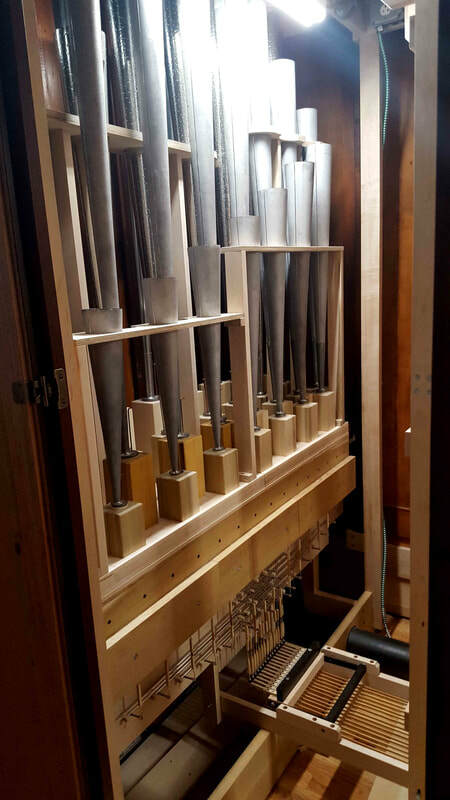 Steve Dieck, formerly of the American organ builder C B Fisk, contacted us to ask if we could make a two-foot stop for Kusakari san, an organ builder he works with in Japan. 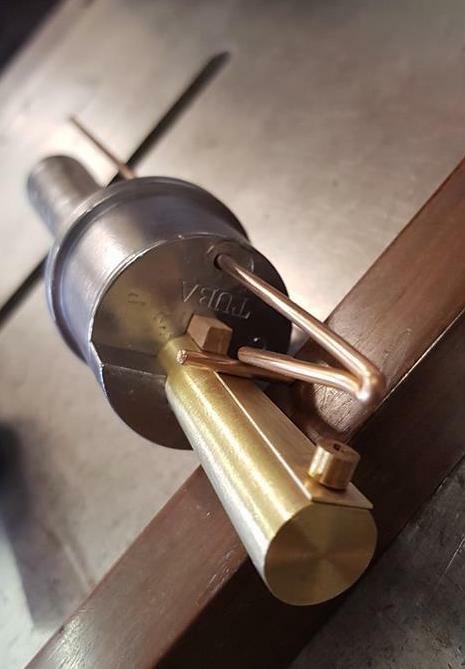 George Fowler made a sample pipe to the specification of the stop. Mr Kusakari and Steve were delighted with it, as we were asked to make five stops in total! ​It has been a pleasure to make these stops and we are looking forward to working with this company again. George Fowler has been making mixtures for over 50 years – and as these pictures show, he’s rather good at it. 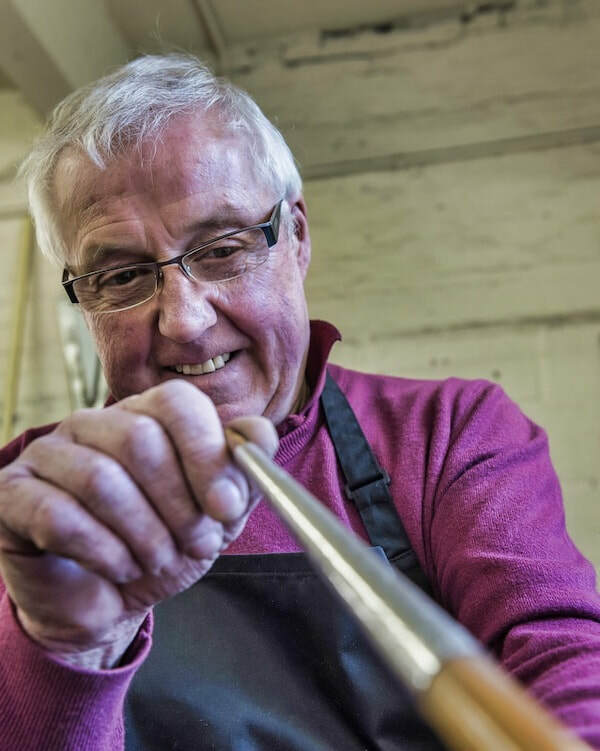 He began making separate ranks when he was an apprentice at FJ Rogers in Bramley, Leeds, and progressed to making multiple ranks for an entire stop 40 or so years ago. 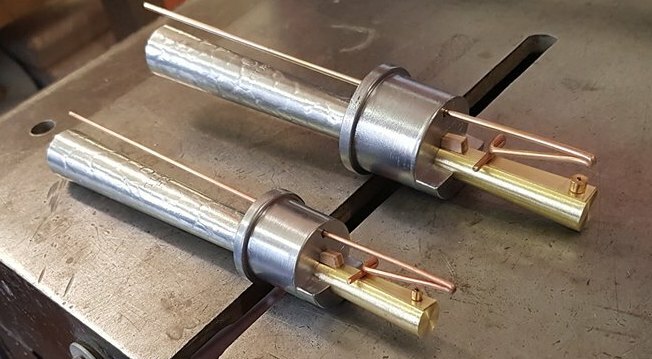 At present he is making a VI rank mixture, above, for an organ builder in America – that’s 335 pipes in total (and 670 pieces to solder) – made from 80 per cent tin. Shortly before starting work on the VI rank mixture, George completed a IV rank mixture. He reckons the total time from cutting out the metal to completion of 560 pipes for both stops is about 240 hours. And at 71, there are plenty more pipes to make and seams to solder. “I still enjoy my work, it keeps me going,” he says. We are grateful for the kind comments about this set of facade pipes on an organ by the American builder, David E Wallace. The diapason rank is made from polished zinc and it has been described as 'lovely' and 'very aesthetic with the dark housing'. 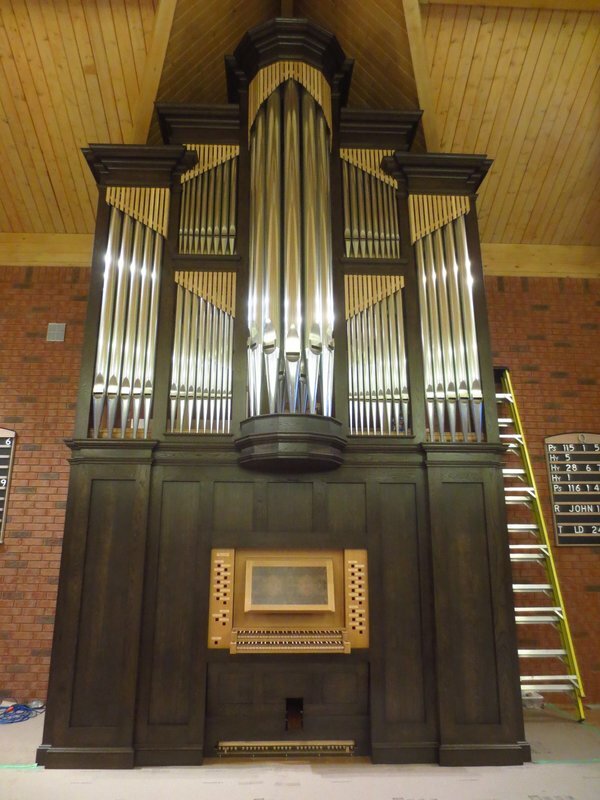 Organists are clearly delighted by the new instrument, the firm's Op 78, which stands in a church in Ontario, Canada. Reeds for Noack Organ Builders' project in Washington are completed. NEWS UPDATE: All of the reeds for our friends at Noack Organ builders are completed. They will be installed in a new organ for St Peter's on Capitol Hill, Washington DC. We are delighted to have worked on this project! On the left are sample pipes of a Tuba which will be sent to a customer to voice. On the right are the spotted metal resonators to hood the pipes perfectly. Im making the pipes, we have used a Willis C scale closed English shallot, a replica of those in use in the organ in Canterbury Cathedral . 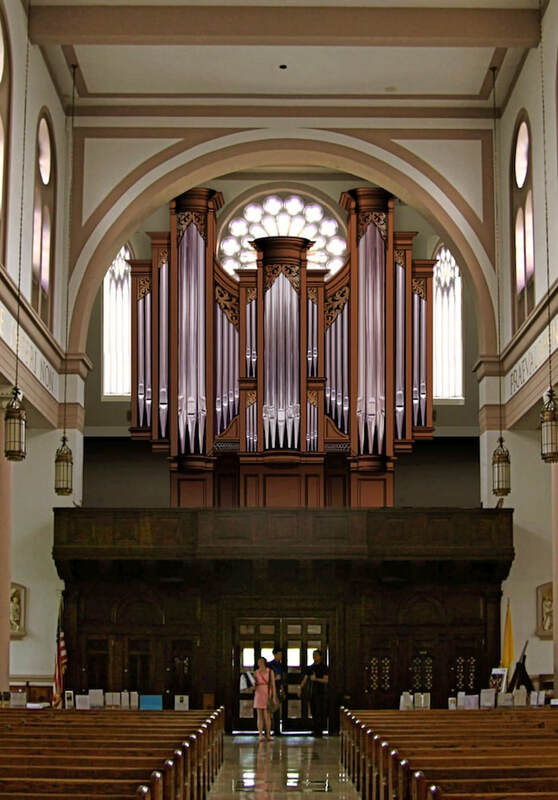 A CGI of the Noak organ destined for St Peter's, Capitol Hill. 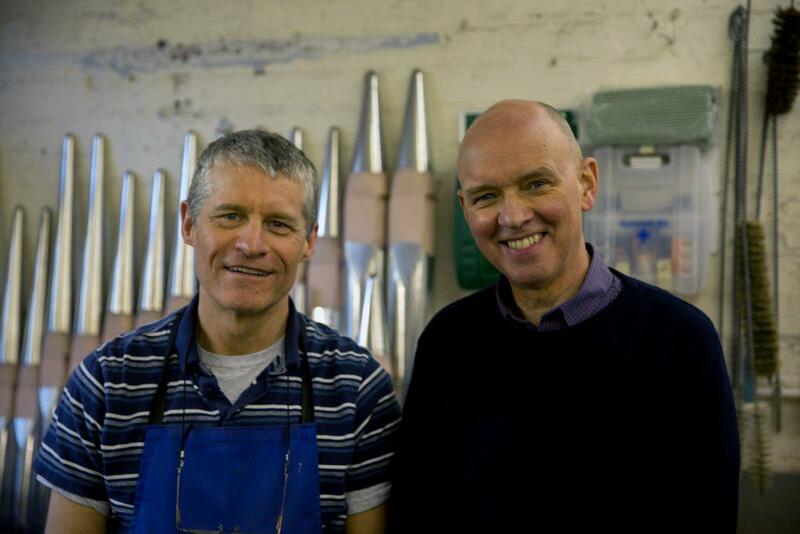 The reeds for a large, new mechanical action organ in the United States are being made in Leeds by Shires Organ Pipes. The three-manual instrument is due for installation next year in St Peter's Catholic Church, right, on Capitol Hill. It is under construction in the Noak Organ Company's workshop in Georgetown, Massachusetts. 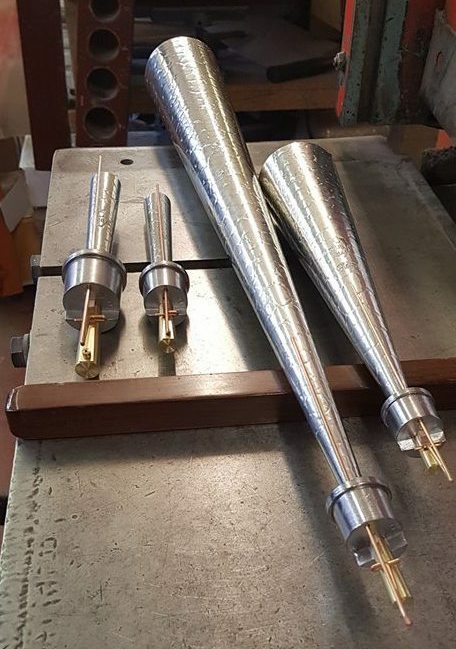 Our team is making a trumpet 8' for the Great; a chamade 8' for the Choir; a bassoon16', harmonic trumpet 8', oboe 8' and harmonic clarion 4 for the swell; and a trombone 16' and trumpet 8' for the pedal. The Three Choirs Festival is a major event in the British musical calendar, so it was an honour to take part in this year's festival in Hereford. 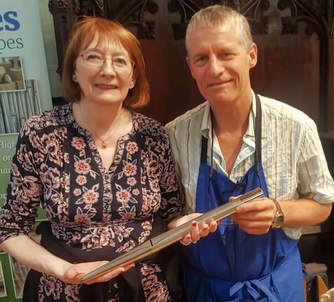 Our managing director, Terry Shires, talked about about his career in pipe making and the history of the trade in All Saints' Church, High Street, Hereford, on August 3. During the well-received session, he also gave a demonstration of pipe making by creating a replica of the middle C Great Principal pipe in the organ at Worcester Cathedral. He says: "I have done many demonstrations like this over the years, and I always ask for a volunteer to have a go at soldering. Kris Johnston made a great job and I presented her with the pipe I finished and voiced." In other news, we are delighted to be working with the distinguished American reed voicer, Chris Broome, who specialises in voicing reeds made by Skinner. 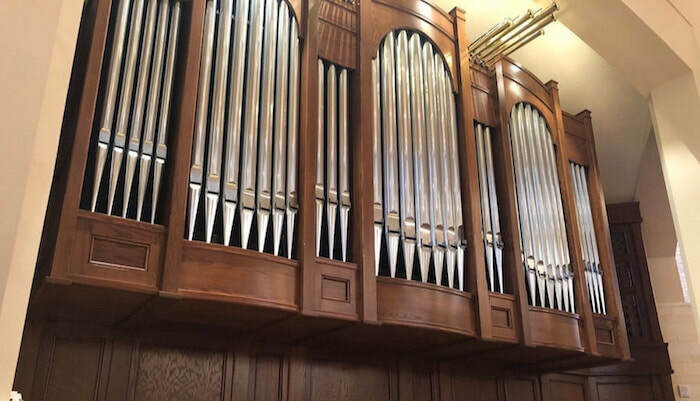 Broome & Co was established in East Granby, Connecticut, in 1998 by Chris and David Broome to satisfy a need in the pipe organ industry for quality voicing and organ pipe reconditioning and repair services. 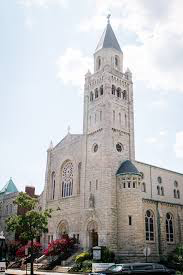 Their company is recognised as a specialist in the restoration of reed stops in pipe organs by major 20th century North American organ builders. We look forward to helping them in any way we can. 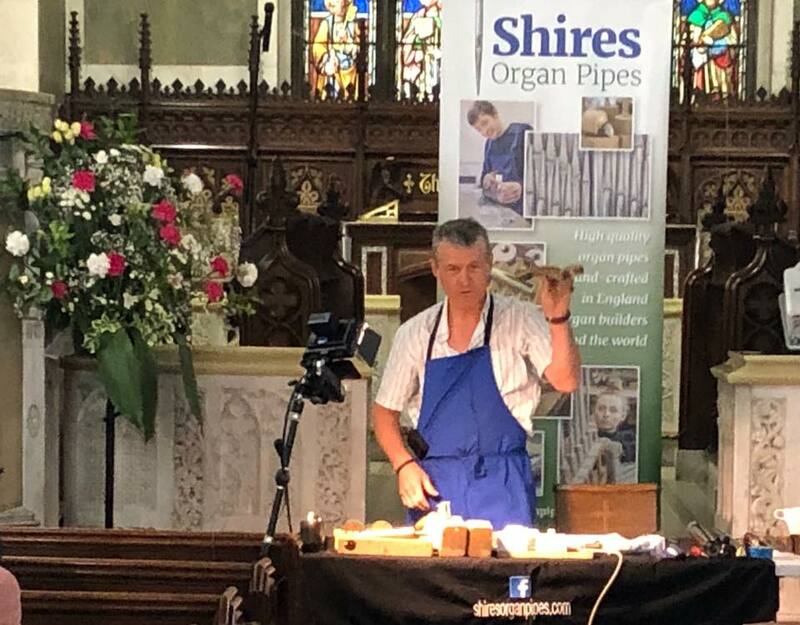 Terry Shires gives a pipe-making demonstration at St James' Church, Didsbury, as part of the Great Northern Organ Day held in association with the Royal College of Organists. 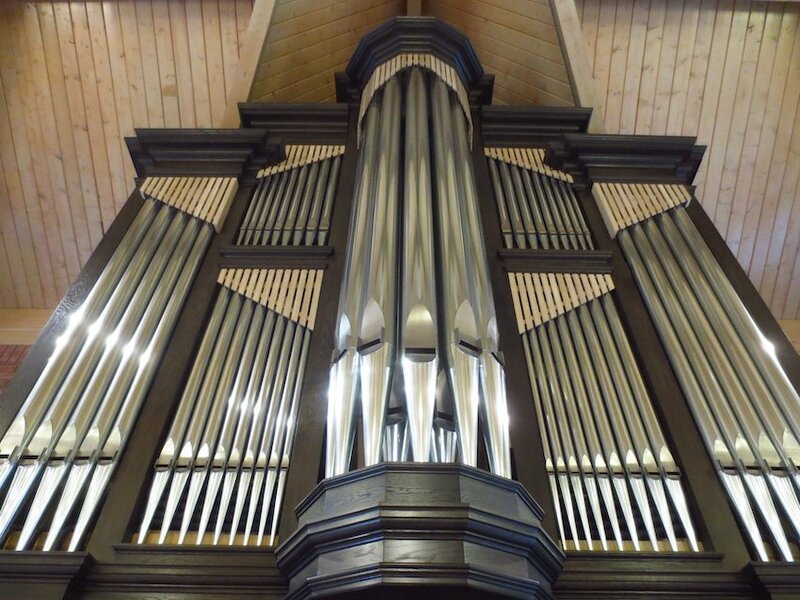 It was a privilege to make the case pipes for a new mechanical action organ of two manuals and 24 speaking stops installed in a church in Canada. The American builder, David E Wallace and Company of Maine, commissioned the pipes from us for their new instrument in Ancaster Canadian Reformed Church, Ontario. It is Wallace's Op 78 and the company kindly describes our pipes as 'lovely'. When the authorities who care for the Lewis organ in the Kelvingrove Art Gallery, Glasgow, wondered how to collect donations for the instrument's upkeep, the penny quickly dropped. 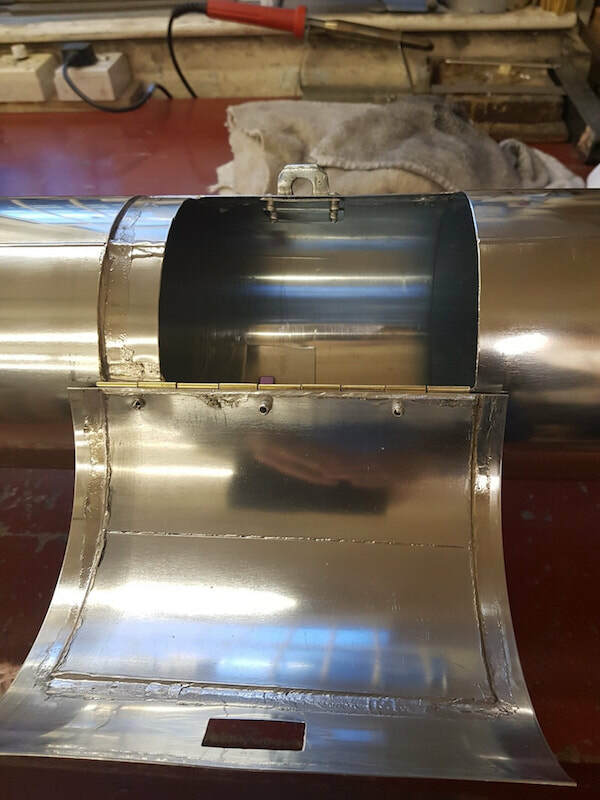 ​They turned to Shires – and we were delighted to make an 8ft Principal display pipe from polished zinc complete with a slot for notes or coins. It contains a canister to receive the money and a padlocked hinged plate at the rear to access it. ​The three-manual Kelvingrove organ, of 48 speaking stops, was built in 1901and hired from Lewis for the Glasgow International Exhibition of the same year. It was bought by the Glasgow Corporation in 1902 and moved to the new art gallery. In 1941, the gallery was damaged during an air raid and the organ was considered unplayable. Repairs were made and the instrument was fortunate to escape any attempts to modernise it. The organ continued to flourish until the mid-1970s, when its condition deteriorated, and a full restoration became necessary. 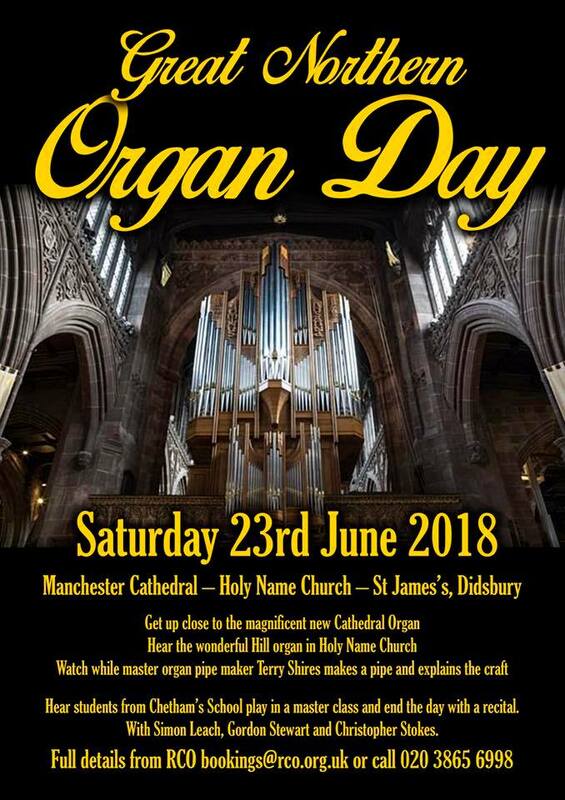 For enthusiasts, the glory of the instrument is the retention of its character as an outstanding example late 19th century organ building. This is the specification. 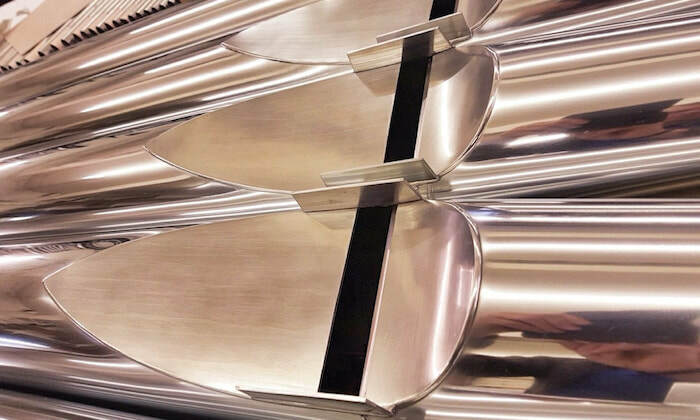 ​An increasing number of our organ pipes are finding their way across the Atlantic. 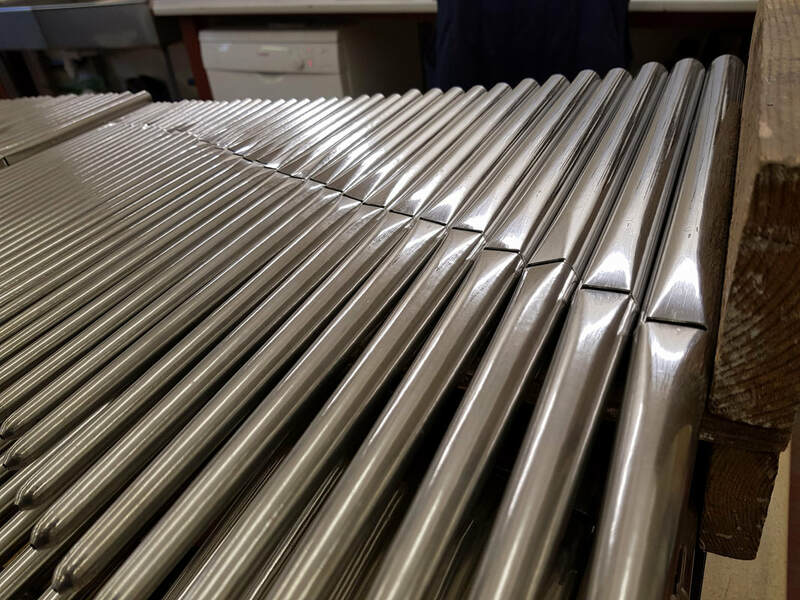 ​We were delighted to be asked to make the polished and lacquered zinc display pipes, top right, for Austin Organs of Hartford, USA. They were made for the new, four-manual organ in the church of St John Vianney, Houston, Texas. 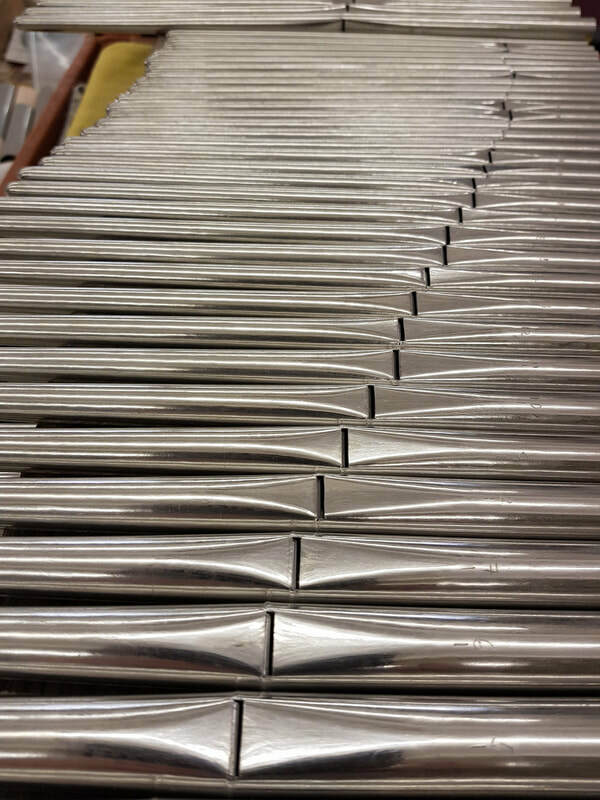 The polished and lacquered zinc display pipes below them were made by Terry Doyle in our Leeds workshop. They will grace the two-manual organ in First United Methodist Church, Henderson, Kentucky. The instrument has been made by organ builder M P Rathke of Indiana as its Opus 10. We were also pleased to supply a IV-V mixture made by our mixture specialist, George Fowler. 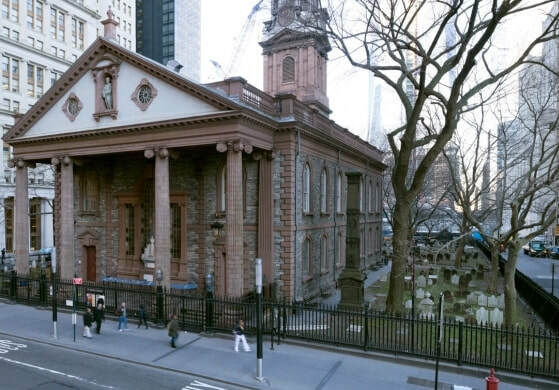 We were delighted to be involved in the renovation of the organ in New York’s oldest public building, St Paul’s Chapel, Trinity Parish. 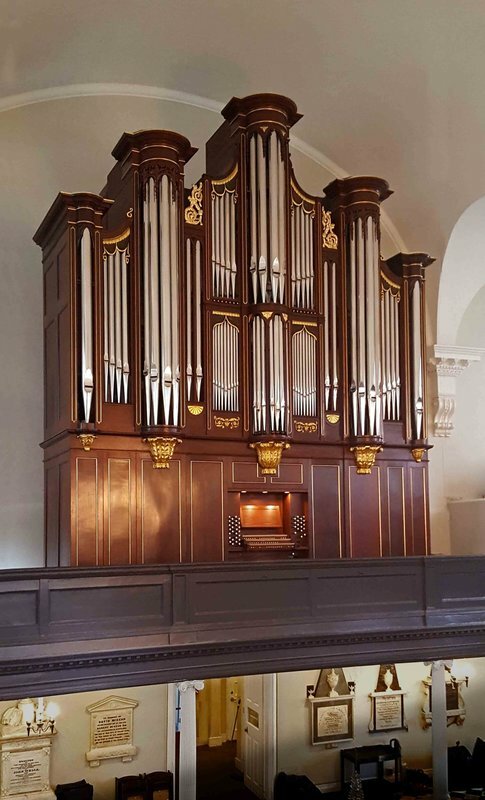 ​The three-manual instrument, built for the Church of the Redeemer, Chestnut Hill, was transferred into the historic case of St Paul’s Chapel by Massachusetts organ builder Noack. The organ received extensive modifications and upgrades, including a new swell enclosure. 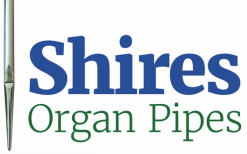 The team at Shires Organ Pipes made the new swell reeds, pedal trombone and facade pipes for this important project. ​The console is now attached en fenêtre and the stoplist has remained very similar to the original. A video has been produced showing the installation of the organ and offering a demonstration of its capabilities. 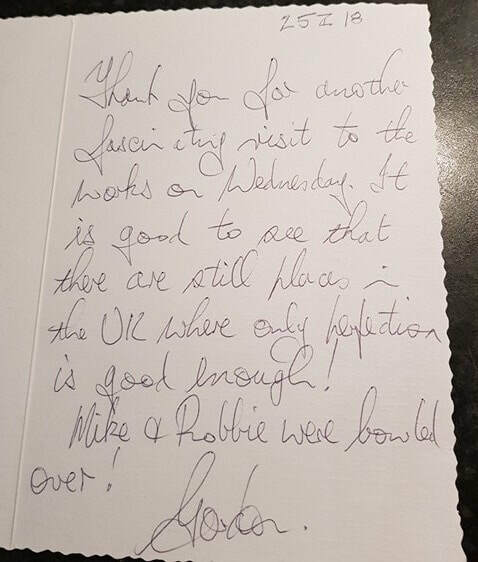 We believe that our colleague, George Fowler, makes the best mixtures in the world. And so do many organ builders in this country and overseas who rely on his meticulous craftsmanship. This III - V rank Mixtur has just been completed and is destined for an organ builder in Europe. The world-famous concert organist – and good friend of ours – Gordon Stewart, paid a visit last week to our workshop in Leeds. He brought two organists, Robbie Lumb and Michael Bolderson, to show them how we make the pipes he plays. It was pleasure to meet our visitors. Following the visit, Gordon kindly dropped us a line, pictured right. The remarkable contribution of organist Ian Barber to the life of Belfast Cathedral over 35 years was recognised at a special Choral Evensong. 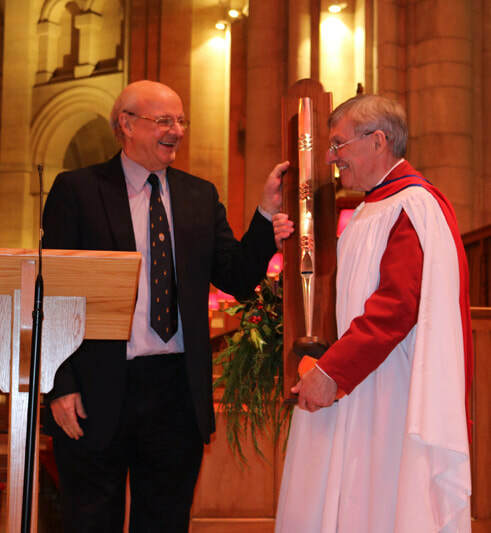 Among the many tributes was one by a former choir lay clerk, Philip Prosser, left, who presented Ian with a gift of a mounted, embossed organ pipe in polished tin. We were delighted to be invited to make this gift to a dedicated and widely respected cathedral musician.